We are located just a few minutes from several corporate headquarters, great shopping at Stonebriar Centre and soccer excitement at Pizza Hut Park! 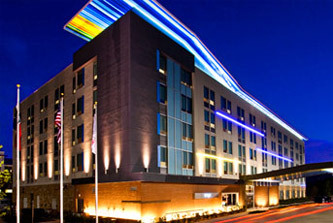 Welcome to the Aloft Frisco Hotel located in the up and coming suburb of Dallas. We are located just a few minutes from several corporate headquarters, great shopping at Stonebriar Centre and soccer excitement at Pizza Hut Park! You are greeted with wide open spaces, mood lighting and music to fit the time of day and conveniences at ever corner. Step over to the ever popular w xyz bar, where you can enjoy our signature drinks and appetizers while shooting a game of pool and listening to our DJ's spin your favorite tunes. Our ultra-comfortable signature bed, an oversized showerhead, custom amenities by Bliss® Spa, will help make you feel at home. In case you need to get some work done or watch all the latest videos you've downloaded, our plug & play connectivity station charges all your electronics and links to the 42" LCD TV.